I had the pleasure of meeting Isabel Kliegman at the September 2000 L.A. Tarot Symposium, and then a month later of deepening that acquaintance at a Tarot workshop conducted by Rachel Pollack and Mary Greer. Ms. Kliegman seemed like such a radiant person that I decided to buy her book, Tarot and the Tree of Life — and what a delightful book it turned out to be! It is accessible, warm, and engaging. It provides gentle guidance without becoming preachy or pedantic, speaking to you, not down to you. But perhaps the best testament I can give this book is to say that it was always hard to set down and always a joy to pick up again. In Tarot and the Tree of Life, Kliegman sets out to discover the terrain of the Minor Arcana using the Kabbalah as a general tour guide. But like any intrepid explorer, she allows herself the liberty of wandering the landscape unfettered by the dictates of her guidebook, and the resulting tangential excursions enliven the narrative of her exploration. The purpose of this book, then, is to illuminate the oft-neglected Minor Arcana using the light of the author’s personal experiences, her Tarot knowledge, and her understanding of how the Kabbalah relates to the Tarot. In her introduction to the book, Kliegman details her reasons for focusing on the Minor Arcana. In my humble opinion the best of these reasons is that “the Minor Arcana have received short shrift and are deserving of fuller exploration.” I highly value, for example, Amber Jayanti’s Living the Tarot, but it only covers the Major Arcana. Now I have a wonderful companion book for the Minor Arcana. It is always nice to find fresh new perspectives of these old, familiar cards, especially when those perspectives are as well considered, explained, and illustrated as they are in Tarot and the Tree of Life. Kliegman presents diverse viewpoints and various layers of meaning for each card, all of which yields some delightful insights. For example, in her discussion of the Six of Pentacles on page 60 she states, “If we see the standing figure as the self, soul, or spirit, we may see the crouching figures as different aspects of our soul, the different roles we play. … We have just so much time and so much energy, and it’s difficult for us to set priorities … Something is always making demands on our time. … [In this card] we see the perpetual challenge of balancing in our own lives the divinely inspired soul, and the necessary body. … The choices we make always involve sacrifice, usually sacrifice of a divine part of ourselves.” This is a remarkable take on this card that I had never considered before. In addition, Kliegman has spiced this book with a healthy, but judicious, dose of wit. For example, on page 141, at the conclusion of the section of the book covering the ever-disturbing Swords cards, she states, “With this observation, we leave our exploration of the Suit of Swords. Rare is the reader who does so with regret.” And rare, too, is the writer who can infuse a bit of levity into a discussion of the Swords cards. Kliegman’s discussions of many of the “problematic” cards in the deck (such as the Five of Pentacles, Five of Cups, Ten of Swords, etc.) are especially helpful. The empathy and gentle understanding that she brings to such cards breathes hope into them, transforming them from dire messages of dread and doom into opportunities for growth, atonement, and salvation. From the mundane aspects to the spiritual, from the outward manifestations to the inner, and from the positive connotations to the negative, Kliegman examines each of the Minor Arcana cards with care, warmth, and compassion. 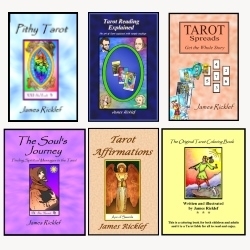 Besides being illuminating, her highly personal examination of the Minor Arcana also invites and encourages the reader to make his or her own personal exploration of them as well. A wonderful book like Tarot and the Tree of Life — one that provides such delightful and fresh perspectives on the cards and does it with such a light and gentle touch — inevitably reinvigorates my enthusiasm for the Tarot, and so I give it two thumbs up. Tarot and the Tree of Life, by Isabel Radow Kliegman, was published in 1997 by Quest Books and is 220 pages.